Today is the day that has gotten the most politics-related discussion from ordinary, normally non-political people, since Election Day 2016. Donald J. Trump, who earned KoopaTV's endorsement for president some months ago, is finally inaugurated as the President of the United States. Today. January 20, 2017. It's quite historic. We no longer have to refer to him as president-elect! KoopaTV is truly fair & balanced, NeoGAF! Unlike you! Source: That one NeoGAF thread that got Ludwig's account banned. As is typical for inauguration days, President Donald John Trump gave an inauguration speech, embedded immediately below. It was beautiful. If you would rather read his speech than listen to it, there's a transcript available on Donald Trump's Facebook page, here. One hour to go before "President Trump: The Inauguration" comes on. But they'll probably have an hour of run-up before the main event. Showing clips of Trump with Obama + wives. Those protesters look like ISIS members. Barron looks just as bored as he did on election night. Give the poor kid a 3DS or something. Commenting on the noticeable sparseness of the crowds compared with Obama. "Donald Trump likes to be the biggest, but he isn't going to be able to say these were the biggest crowds for a swearing-in ever." "He probably will anyway, to be honest." lol Bernie looks so forlorn. Obama and Biden arriving now. Obama's last words to the American people as President: "Thank you." Mike Pence coming out now. Apparently his middle name is "Richard". Shaking hands with the Obamas. "Welcome to the inauguration of the 45th President of the United States of America". Quoting Reagan: "What we do here is both commonplace and miraculous." Basically going over noteworthy points from past inauguration speeches. Archbishop of New York now giving a reading from Solomon. Now quoting from Jesus' Sermon on the Mount. Now thanking God for America and asking to bestow wisdom on Trump. Missouri State University Chorale now singing. Their hates look like tea cosies. Wondering if these guys replaced the Mormon Tabernacle Choir, or if they're coming up later. News crawl: "Washington police disperse anti-Trump protesters after shop windows are smashed." "I hate Donald Trump and everything he stands for, so I'm going to smash this poor bloke's business!" The American people are what give him confidence in the face of tumultuous times. All stand as Mike Pence about to take the oath. He looks quite moved as he waves to the crowd as the new VP. "We will get the job done." The Obamas have been "magnificent" during the transition process. "We are transfering power from Washington D.C. back to you, the people." "The people did not share in Washington's wealth." Basically he's savaging the establishment. "That all changes right here, right now. This moment is your moment, it belongs to you." "This is your day, your celebration, your country." "January 20th 2017 will be remembered as the day the people became the rulers of this country once again." "This American carnage STOPS, right here and right now!" "We are issuing a new decree: From this day forward, a new vision will govern our land. America first. America first!" "I will fight for you with every breath in my body and I will never, ever let you down." "We will follow two simple rules: buy American, and hire American." Pledges to eradicate radical Islam from the face of the Earth. "When you open your heart to patriotism, there is no place for prejudice." "When America is united, America is totally unstoppable." More bashing of "all-talk, no-action" politicians. "Now arrives the hour of action!" "To all American, hear these words, you will never be ignored again." Ends on: "Together, we will make America great again!" Rabbi now asking for blessings on Trump. Apparently it started raining when Trump took to the platform, which these religious types are passing of as a sign of God's blessing. Trump going off to lunch now. I loved how Trump continued to attack the establishment even as they're seated all around him. Thus begins the Trump Years. What the-- Now Obama's speaking. Going on about him and Michelle "milking their goodbyes". What makes today particularly special, other than the very close kinship between KoopaTV and the new President of the United States, is that today was SUPPOSED to be the last day of KoopaTV's existence. KoopaTV was supposed to end upon Hillary Clinton being crowned as queen of the United States of America. This was going to be our last article. Our good-bye. The miracle was supposed to never happen. Instead, just as President Donald John Trump's victory belongs to you, KoopaTV's continued existence belongs to you, as well. We're here for you. We're your resource. 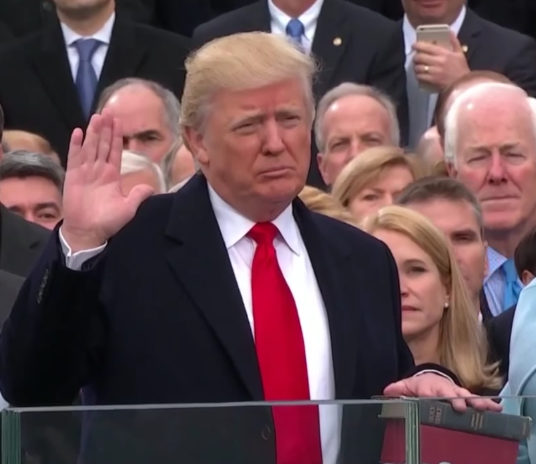 President Donald John Trump being sworn in. That's why doing things like participating in the KoopaTV Feedback Forms is pretty important. We not only love hearing from you, but in order to be doing our best job serving you, as President Donald John Trump will serve the American people, we gotta know what you think. I've never been more proud to have helped influence the results of another nation's election. You've done well, America. KoopaTV will keep you in the know about anything game-related that happens during the Trump Administration, or anything that could be tangentially-related to gaming, at least. Surely nothing as bad as what could've happened if Hillary became America's dictator, right? KoopaTV will be celebrating this weekend. Hope you don't get killed in a protest/riot somewhere! If you still refuse to accept the results of the election, you can go back in time and have another Republican win the primaries... with KoopaTV's very own flash game, The Wonderful 1237! The first Trump-related KoopaTV article written after this inauguration is criticism of the administration's careless lack of detail. Click here for a reflection of all of the coverage KoopaTV has given to President Donald John Trump for the first year since his inauguration. So... what's your point, if any? Okay... Maybe he will make America great again. Maybe he'll release his tax returns now that he's Presiden- oh. Well, maybe he'll fix the ACA? Ah... Have I mentioned it's only the fourth (now fifth) day, and there's already two protests. I don't even know which is the best timeline anymore. The Donald John Trump , or the Hillary Diane Rodham Clinton era. I see both sides, just that biased reports don't ever show it. Goes to show to not rig the elections, or have the media put too much attention on one guy. The good thing about all of this (other than the promised PayPal money I never got) is that... KoopaTV is alive. I guess. We can try to Alternate History in a few years. (Wot promised PayPal money?) Yup. Alive and shell-tossin'. In a few years? That's practically over one thousand days! And it'll take a long time to actually write out the Alternate History, too. There was just a "supportive, but it's really clickbait" comment here. Why give compliments if you're trying to promote your content? Why not put a link by showing a comparison, like, "I made similar points in my own site, too."? You give compliments because of the norm of reciprocity. Essentially, people are naturally inclined to do something nice for someone if they do something nice for you. The robot complimented my article/website, so I'm supposed to be inclined to compliment theirs, which means I'll click on it.